That first link to Luke Cage, Power Man presented a striking resemblance to another Chicago “Power Man” (at least to me it did) – Sweetness himself, Walter Payton – http://tiny.cc/6k45p. I also wanted to make some statement regarding your mild-mannered, quiet, cubicle-bound, self and the obvious parallels with Peter Parker or Clark Kent, but I will have to leave that up to someone with much more adroit writing skills than myself. 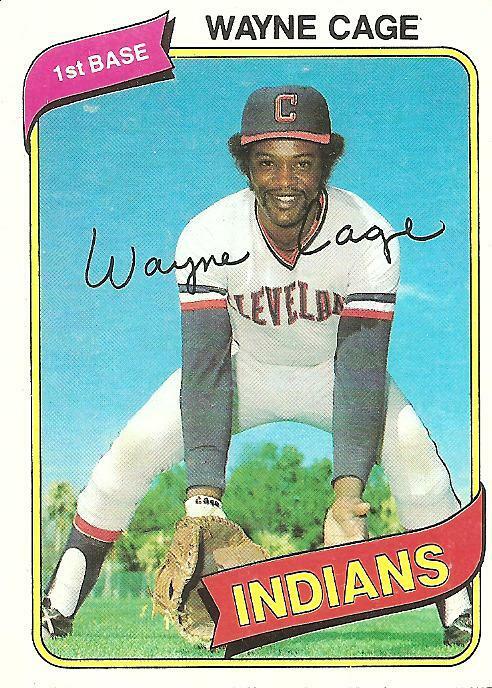 I am testing my memory on this one, but I believe I read in Sparky Lyle’s book The Bronx Zoo that Graig Nettles once pointed to Wayne Cage and told Lyle “I never saw a player with his address on his uniform”. I also came across that anecdote about Nettles when casting around the web for traces of Wayne Cage. The witticisms of Nettles come up a lot in such searches. He seems to have been pretty quick with the wisecrackery. Yeah, Nettles was always quick with acerbic one-liners. The Georgie Jessel joke may be my favorite. As soon as I saw you’d posted Wayne Cage, I thought “Luke Cage – Power Man!” What was Iron Fist’s deal? He was some white guy who was good at kung fu, right? Did Power Man & Iron Fist even have cool villains or did they just beat up ghetto gangsters? It’s all a bit hazy. Do you remember all the MEGO action figures of comic book heroes and villains? Captain American & Falcon were always favorites. Ah, yes, “Falcon.” He’d have to be the honorary superhero of the Oates/Garfunkel/Messina world tour. Though long neglected, Luke Cage has had a bit of a revival in recent years, and is now one of the key characters in the Avengers (the Superfriends of the Marvel Universe, for those of you not comic book nerds.) Unfortunately, he no longer wears the afro and yellow shirt. ralphdibny: Yeah, I guess I’m not the only Luke Cage fan. Apparently there’s a Luke Cage Power Man movie in the works, to be directed by John Singleton. philo65: Thanks for the encouragement! I’ll see your Luke Cage/Iron Fist and raise you Shang Chi: Master of Kung Fu. I was always (and still am) a DC guy first, but Marvel DEFINITELY had the ’70’s Kung Fu fad cornered. RE: “The Infielder’s Crouch”…we’re only taking about posed shots, right? Because my favorite college football player (Rick Leach, University of Michigan Class of ’79) had a 10-year MLB career as a journeyman utility player…and his Fleer rookie card (#272) from 1982 and his last card as a Tiger from 1984 (Topps #427) both show good examples in profile (he was a First Baseman, after all). Actually, I’m just looking for any excuse to add Rick Leach to the discussion…GO, BLUE. I just finished reading your book last night and it reminded me of my comic-book hobby from the 1970’s. And Luke Cage Comma Power Man was one of my favorite superheroes too. So I spent a bunch of time looking at the covers to his books over at Cover Browser (http://www.coverbrowser.com/). Then I come here today and see this. Chills. beearl: That’s a great coincidence–thanks for letting me know. I think I might have mentioned Luke Cage in the book, in the JR Richard chapter. My thoughts never stray too far from comic books, Mad Magazine, and, of course, baseball cards. tzig9: I think I picked up the habit of piling adjectives one on top of the other without commas from Ginsberg and Kerouac.